Flash Memory to keep config setup when power is off. 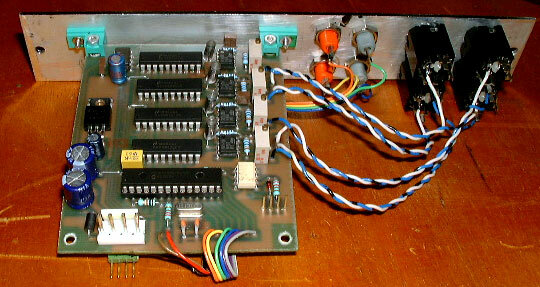 The MCV876 interface is builded with a PIC16F876 clocked at 20MHz. 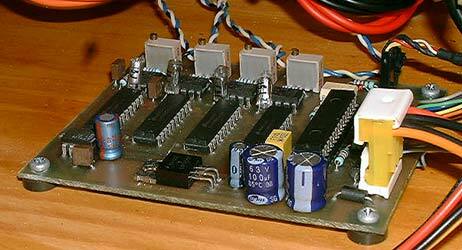 Digital to Analog converters are DAC0832 , DAC0831, DAC0830. They are good old industry standart low cost 8 bits DACs with latches. The voltage reference is a REF01, more expensive than the TL431, but no need of trimmers & resistors to get a stable +10V reference voltage... For CV output amplifiers i suggest the a good old LM358 who the best quality/price ratio i have found for this application. Anyway most of classics dual amplifiers will work fine here. Best one here are precision ones with a low drift, low offset . Trimmers near opamps are to adjust CV scale to 1V/Oct with a 0 to 10V range. 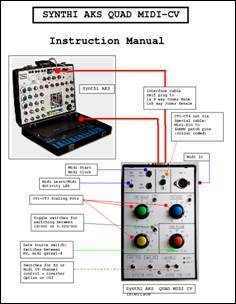 They are options, but it is recommended to keep them for CVs output accurate calibration. The 20MHz crystal is replaced by a 10MHz one. No other hardware changes. The DAC1231 is a 12 bits DAC pin to pin compatible with DAC083x. 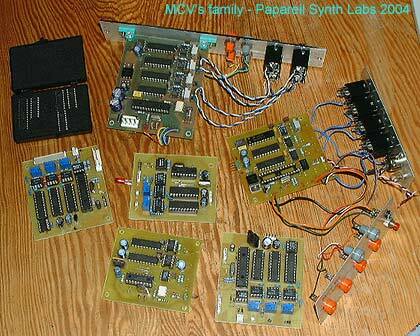 It is possible to use it in 12bits mode with a minor modification on the MCV876 pcb . Very simple to do. It also require a special firmware/software set ... Check the link bellow ! The main piece of code, the brain of the interface. Each firmware (*.hex) have his own MIDI config PC software (*.exe). Burn the Hex file into a PIC and use the config software to setup parameters. Click here to know all about the last MCV876 firmware versions bug fixes and new features ! It is a multi purpose led! At the first power on the led blink 3 times short + 2 long . It means "All is ok" ," no config found in Flash memory" and "config by default is loaded instead". It is an easy first boot feature. When config parameters are already set into the Flash RAM, the led blink just 3 time at power on. Then the led will monitor all incoming recognised MIDI status bytes.The led also blink 3 long times if the interface receive the "Write To Flash" sysex message. When this message is received, all MCV876 parameters are writen into the flash RAM. So the MCV876 can recall setup even after a long power off ... When the interface is in MIDI Learn mode, the led stay on, until a MIDI message has been received and learned by the interface. The firmware V3.03 allow to exit the learn mode by pressing again the learn button . 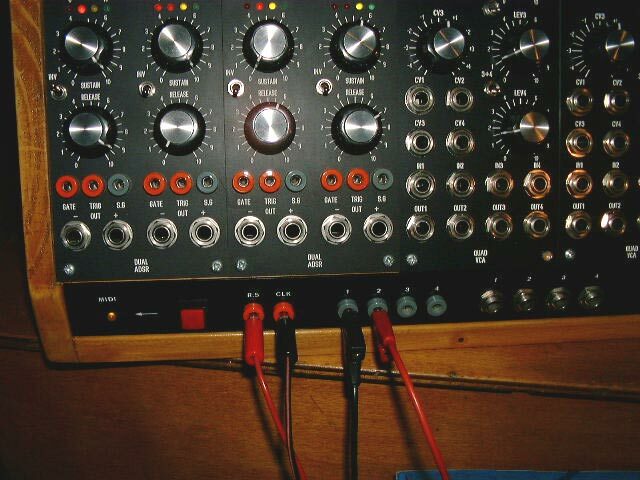 When you push the MIDI Learn switch , the led stay on and the MCV876 is in Learn Mode waiting to receive a MIDI message containing MIDI channel information. When a message arrive ( you play a note on the master keyboard for example) , the MIdI channel is extracted , compared to the actual interface MIDI channel and set to this new value if different. 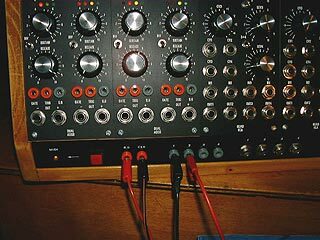 If the MIDI channel of the message is identical to the interface one, and if the message received is a MIDI note ON message, the interface extract the MIDI number of the note played and set this value as the reference ( base) note. This allow to transpose the MCV876 to any note on the keyboard. The reference note is the Lowest note the interface can play ( digital zero). 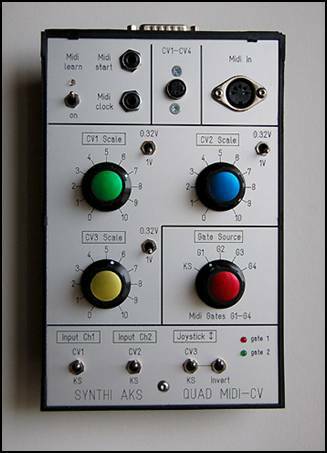 The firmware v2.71 PIC16F876 is mono-channel = all messages are received on an unique channel .The interface "Play-mode" define the CV/Gate 1 to 4 output setup and associated MIDI messages. CV2 , CV3,CV4 are assignable to controllers, velocity or PitchBend..
CV3 and CV4 are assignable to controllers, velocity or PitchBend..
Gate1 to Gate4 are assignable to Controllers or 4 fixed Notes ( one for each gate.. The firmware v3.03 PIC16F876 is Multi-channel. CV2, CV3,CV4 are assignable to controllers, velocity or PitchBend..
Gates 2,3,4 are assignable to controllers. CVs or gates can be assigned to MIDI notes or controllers independantly. Pitch bend is centered on digital data value 0x2000 = +5V ( half scale in 0..10V mode ). Pitch Bend DAC range is 0..10V by default. All MCV876 parameters are editable by MIDI exclusive system messages. 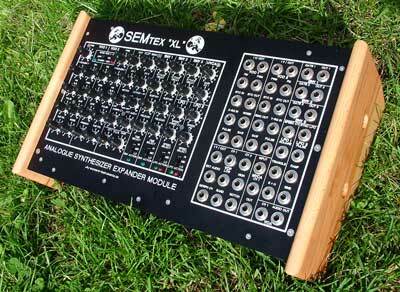 They can be send by the PC config software or written/recorded into patterns on your favorite sequencer/midi editor sofware ( Mac User's...) . 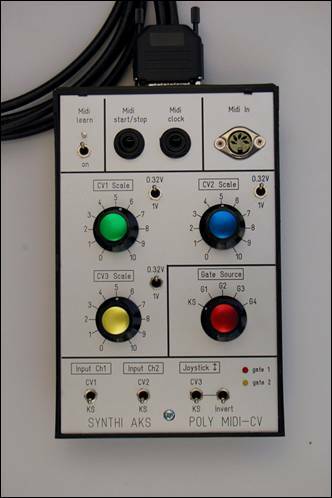 Sysex messages are also used by the MCV876 MIDI Remote Control Unit .